Anyone who knows me knows that I drink an IPA almost every day. 1. I love that it is a social media driven event. I’m a social media junkie. 2. Anything that gives me an excuse to yammer about craft beer is cool with me. 3. Any reason for breweries to pimp their beer, have events, and promote craft beer is plain awesome in my book. 4. It’s my favorite style of beer, and from my experience, the most misunderstood. This last reason may be my favorite reason. I have been told by many people that they cannot stand IPAs. They protest that the beer is too hoppy, too strong, too heavy, too this, too that. And then they hit just the right one and fall in love. Not everyone will love IPAs, I get that. I’m pretty sure I will never fall in love with a barleywine, but I’ll keep tasting them in the meantime. So I love that #IPAday may give someone who normally wouldn’t drink an IPA an excuse to drink one, and just maybe, become a fan. There has been a small amount of brouhaha over #IPAday. People getting pissy that they don’t need a special day to drink an IPA. People getting pissy that this will snowball into “holidays” for all types of beer. People getting pissy for the sake of getting pissy. When it comes to beer, and life, I’m pretty chill. I’m cool with Miller existing and people drinking it. A friend once told me that sometimes it’s just nice to have a Bud Light with lunch. I think he’s come around since then, but honestly, it’s not a big deal. I’ve been known to slam down a shandy or two, and even enjoy it. But the fact is, that in my heart I’m a beer snob and love to convert people over to craft beer. So if someone wants to institute a day for IPAs, a day for Saisons, a day for Porters, a day for Sours or even a day for Barleywine, I’m down. Stout day already exists, so maybe that snowball is already rolling. I’ll be enjoying #IPAday at the first Milwaukee Barley’s Angels meeting, so if you’re a gal and you want to join in, come to Sugar Maple! Great Post!! Love the IPA Day!! And with that, I picture you dancing Reggie. Perhaps I shall embed the video. I love #IPADay, #StoutDay, and American/Milwaukee/Wisconsin Beer Week, and yet I can see where some of the detractors are coming from. 1) Beer is gaining awareness in popular culture, but there is still a long ways to go before good beers have the same level of recognition of wine. Anything we can do to help increase the profile of beer is good for the industry. 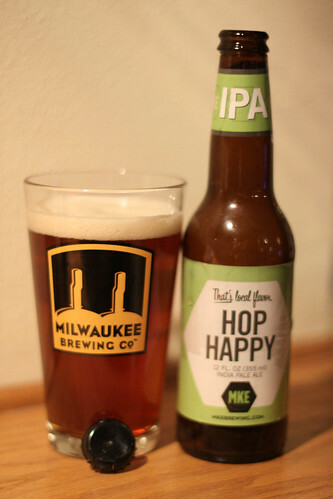 2) IPA is a beer style that does have an acquired taste. Even for drinkers who have the awareness of the craft beer scene, they may not have acquired the taste for IPAs. If we can encourage those folks to try an IPA again maybe they’ll discover that they like them. I know personally, I didn’t like IPAs for a long time. I considered myself a good beer drinker, but I just couldn’t palate IPAs. Then one day I tried one and I was in love. I haven’t looked back since then, and even beers I remember not liking before I acquired the taste have become some of my favorites. 3) Any excuse to help all the small businesses involved in the craft beer scene is a good excuse in my book. Most craft breweries fit squarely in the small business category. Most bars fit the same profile. If we can help both of these types of businesses out, in a small way is helping entrepreneurs. 4) The “Problem” with IPADay and the like, is that taking the craft beer message to twitter may be more preaching to the choir. The participation I’ve seen for #IPADay and for #StoutDay has all been from people who already are craft beer evangelists. I haven’t really seen much activity relating to any of these hashtag holidays from anyone who isn’t already talking about craft beer on an almost daily basis. If you’re a member of their audience and seeing their #IPADay message, you are most likely already a member of the craft beer community, and the message probably won’t change your position. 5) This brings out one of the biggest limitations of social media. It’s very, very, very difficult to change peoples minds about complex issues via a 140 character tweet, or even a longer facebook post/blog post. If we increase the number of hashtag holidays to include #SaisonDay, or #AmericanStongAleDay, we run the risk of increasing the signal to noise ratio of social media. More fluff content can possibly turn people off even if they would otherwise be interested in our message. All told, I spent #IPADay much like I’ve spent almost every other day for the past several years, I cracked open a few craft beers and enjoyed them. That’s not a bad way to spend an evening. Damn it Reggie, I thought that would be video of you dancing.